Maze Wars Beta 2 is out! Visit the Maze Wars forum to meet other players and schedule games. Maze Wars is a fast-paced first person action game inspired by "Super Maze Wars" (1992 Callisto). A game of Maze Wars will typically last a few minutes and is centered on a certain predetermined goal. There are multiple game types, including Skirmish (kill or be killed), Frenzy (find the goal first), and Capture the Flag (obtain the enemy's flag and return it to your base), and each can be combined with different win conditions and scoring systems. 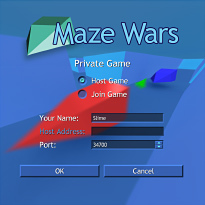 Maze Wars can be played in single player mode against AI opponents with three levels of difficulty, or in multiplayer mode over the internet. 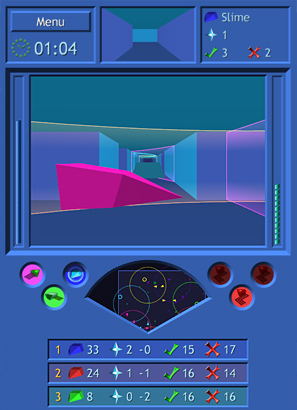 Maze Wars should run on Windows 98, 2000 or XP, and possibly other versions of Windows. Maze Wars is currently in beta. I am looking for gameplay feedback and bug reports. If enough people want a certain feature, it's bound to find its way in. Download the installer and follow the instructions to install. 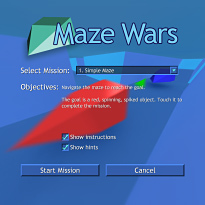 Use the Maze Wars shortcut on your desktop to launch Maze Wars. Type in your name, select "Mission Mode," and press the OK button. Click the Start button to begin the first level. Maze Wars is in beta right now. I would strongly appreciate any bug reports or gameplay feedback that you may have. You can contact me through the contact page or the forum. Think a level is too difficult? Think a new game type is needed? Did it crash on you? Please, let me know! If you find a bug, especially if it causes the game to crash, please try to remember exactly what you (and all other players in a Multiplayer game) did just before the crash occured. Please provide as much detail regarding the state of the game during the crash as possible. This includes the game type, whether it was single or multiplayer, whether the host or a joined player crashed, and whether any other games had previously been played before the crash occured and what type of game they were. Powerups: are any powerups too strong or too weak? Are there not enough or too many of any individual type of powerup? AI: are the difficulty levels of the AI opponents reasonable? If anything frustrates you or makes you want to stop playing, let me know about it. Of course, I appreciate positive feedback also. Key Mapping: The much requested Key Mapping feature has been implemented. Edit customkeys.txt to change your key configuration. Mission Mode: Enter Mission Mode to learn the game through a sequence of premade levels of increasing difficulty. This is the best way for a new player to learn how to play Maze Wars. Simpler Game Setup interface: Setting up games is much easier now, and the Game Setup screen is better organized. All of the old options are still there, but now some of them are hidden behind "advanced options" checkboxes. Slimeland.com interface: Now you can create and join games publicly through slimeland.com. This makes it much easier to play a multiplayer game if you don't personally know anyone else who plays Maze Wars. Miscellaneous bug fixes and improvements: A number of small bugs have been fixed and minor features added. Thanks to everyone who reported bugs or made suggestions; keep the feedback coming! After downloading Maze Wars, extract the contents of the zip file into any folder. Open mazewars.exe to launch the game. The first thing you will see should be the Main Menu. The Main Menu allows you to choose between four gameplay modes. On the left are two Single Player modes: Custom Game and Mission Mode. On the right are two Multiplayer modes: Slimeland.com and Private Game. Each mode is a different way to get into a game. Select the mode you want and type in your name. Your name is used to identify you in the statistics at the end of the game. In a Multiplayer game, your name will be displayed to other players over your ship. When you are ready, press OK. Selecting the Custom Game mode brings you right into the Game Setup Screen, where you can begin a single player game. Selecting Mission Mode brings you into the Mission Selection Screen. Although the gameplay in Mission Mode is similar to the gameplay in the other modes, it brings you through a series of preset challenges. This is the best option for a new player who wants to learn how to play the game. Select the mission you want to play. At first, only one mission is available; as you beat each mission, later missions will become available to you. The objectives for the mission are displayed; read them carefully so you know what you're trying to do. When you are ready to start the mission, press Start Mission. If you want to return to the Main Menu, press Cancel. The "Show Instructions" and "Show Hints" checkboxes are available to turn on and off in-game instructions and hints during the missions. If "Show Instructions" is checked, instructions will occasionally be displayed as you play through the missions, explaining how to play the game. If "Show Hints" is checked, hints will be displayed which help you through the missions. Read and follow both of these types of messages carefully and you will have an easier time with the missions. To view instructions and hints which are no longer displayed, or to see the objectives for the current mission, press the Enter key or the T key. This will bring up the chat window which displays all of the text that has appeared throughout the game. Press the Enter key again or the Escape key to close the chat window. 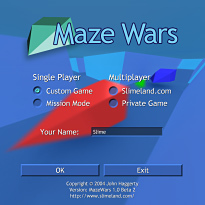 Selecting Slimeland.com brings you into the slimeland.com menu, where you can find other Maze Wars players and join in games with them. You can either join existing games, or create a new game. To join a game, first click the Refresh List button. Maze Wars will connect to slimeland.com and get a list of available games. If there are any, they will appear in the dropdown on the left. Select one from the dropdown and click the Join button to join that game. You will enter into the Game Setup Screen. If there are no games available, you may choose to host one and wait for others to join. To do this, type in a name for your game in the textbox beneath "Create Game", choose the port on which the game will be hosted (if you don't understand this, just leave the default value), and click the Create button. 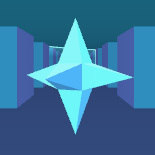 You will enter the Game Setup Screen, and Maze Wars will then connect to slimeland.com to put your game on the list for others to see. At the top of the screen is a textbox where you can change your name if you want. Selecting Private Game brings you into the Private Game menu, where you can create and join games that aren't made available to the public on slimeland.com. To host (or create) a game, select "Host Game" and press OK. You will enter the Game Setup Screen. Your address will be displayed in the upper right; people who want to join your game will need it. To join a game that someone else is hosting, select "Join Game," and next to "Host Address," type in the address of the person hosting the game. Then press OK, and you will enter into the Game Setup Screen with the other players. You can change your name in the "Your Name" textbox before hosting or joining a game if you wish. The port option allows the host to set a port on which the game will be hosted; the players joining must enter the same port number. If you don't understand this option, just use the default value. When you get into a game, the Game Setup screen will appear. This screen provides a number of options with which you can set up the game you're about to play. When you're satisfied with the settings click Start Game to begin the game. Clicking Cancel will return you to the previous menu and, in a Multiplayer game, disband the other players. If you have joined a Multiplayer game, then most of these options will be disabled; only the host can set them. You can still choose which team you are playing on. For more information on the differences when in Multiplayer mode, see Multiplayer Games. In Single Player mode, at the very top of the Game Setup screen, you are given the ability to change your name if you want. To access different types of game options, click the tabs along the top of the screen. The first set of options under the "Maze" tab have to do with the maze on which the game will be played. A variety of mazes are available and can be chosen from by clicking on the "Maze" dropdown. To the right, a preview of the maze that you select will be displayed. Black areas represent walls. Many mazes are repeatable, and can therefore be set to different sizes. Choose the size you want in the "Desired Size" number boxes. Maze Wars will display the closest size that the selected maze supports under "Actual Size." If the "Desired Size" number boxes are disabled, then the selected maze is a fixed-size maze and does not repeat. The options under the "Teams" tab allow you to set up the teams that will compete to win the game. First, choose the number of teams with the "Number of Teams" number box. You may have anywhere from 1 to 16 teams in a game. The "Players per team" number box lets you set the number of players on each team, and the "AI difficulty" dropdown lets you choose the difficulty of the AI players that make up the teams. For instance, if you have 3 players per team and "AI difficulty" is set to "Normal," then you will be on Team 1 with 2 Normal AI players, and Teams 2 and 3 will each consist of 3 Normal AI players. Check the "Observe game" checkbox to observe the game rather than play in it. This way, AI players will fight each other while you watch. If you wish to have more control over the teams in the game, click the "Advanced team options" checkbox. For each team, you can select a number of Easy, Normal, or Hard AI opponents that will compete on that team by modifying the number in the number box of the corresponding column. You can select the team on which you will play by clicking the appropriate radio button in the "You" column. The total number of competitors in each team will be displayed in the "Total" column. You may choose to Observe the game (and therefore not compete in it) by clicking the radio button in the "Observers" row. The "Game Settings" tab provides options that let you control the type of game you will play. The most important setting is the "Game Type" option, from which you can choose between Skirmish, Frenzy, or Capture the Flag game types. Each game type is explained in detail below. Beneath this dropdown is a brief description of the game type you have selected, and to the right is a simple illustration of the game type's elements. The next setting is the "Scenario" dropdown. This lets you choose in more detail how the game will end and how it will be won. Beneath the dropdown is a description of the scenario you have chosen, including the objective and the scoring system. When the objective is complete, the team with the highest score wins. If you want to have more control over the game, click the "Advanced game options" checkbox. The game will end after the specified number of minutes. As soon as the Kill count of any single player reaches the specified number, the game will end. As soon as the Death count of any single player reaches the specified number, the game will end. As soon as any single player obtains the specified number of goals (in Frenzy) or returns the specified number of flags (in Capture the Flag), the game will end. As soon as the combined Kill count of all of the members of any team reaches the specified number, the game will end. As soon as the combined Death count of all of the members of any team reaches the specified number, the game will end. As soon as the combined number of goals that are obtained (in Frenzy) or flags that are returned (in Capture the Flag) by all of the members of any team reaches the specified number, the game will end. As soon as the total number of flags that are lost to other players (in Capture the Flag) by any team reaches the specified number, the game will end. As soon as any team obtains the specified score, the game will end. The scoring is determined by other options which are explained below. As soon as the combined Kill count of all of the players in the game reaches the specified number, the game will end. As soon as the combined number of goals that are obtained (in Frenzy) or flags that are returned (in Capture the Flag) by all of the players in the game reaches the specified number, the game will end. As soon as the sum of the scores of all of the teams reaches the specified number, the game will end. The scoring is determined by other options which are explained below. The game will not end. In Multiplayer mode, the host may still force the game to end through the in-game menu. Game end conditions that have to do with scores allow negative numbers to be specified. Finally, the scoring system options can be set. The team which has the highest score at the end of the game will win the game. There are four actions which can change a team's score: a Kill by any player in that team, a Death by any player in that team, a goal (in Frenzy) or flag returned (in Capture the Flag) by any player in that team, or a flag lost to another team (in Capture the Flag). Check the checkboxes next to the actions which you want to count towards a team's score. To the right, you can select the number of points awarded or revoked for each action. For instance, if you check the "Kills increase score" checkbox and the "Deaths decrease score" checkbox, and you assign points of 5 and 3 respectively, then a team will gain 5 points when one of it's members kills an opponent, and it will lose 3 points when one of it's members dies to an opponent. Points can be set to negative numbers. This can be used to create interesting game situations: try a Capture the Flag game in which points are lost for killing other players. The goal in such a game would be to obtain as many flags as possible while minimizing the number of opponents killed; however, it may still be worth killing an opponent if it will prevent them from retrieving a flag and gaining points for their team. Another option would be to assign negative points for deaths which is equal to the points for kills; this would award points to both the team with a member that kills an opponent and to the opponent's team. With multiple teams in a game, this would require the strategy of killing players only on the teams with the fewest points. 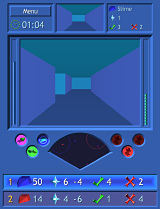 Once the game begins, the In Game screen will appear and you will appear within the maze. There are a number of interface elements which give you information about the current state of the game. At the top of the In Game screen are three boxes. The leftmost box contains the "Menu" button, which when pressed will pause the game and display the menu screen. Below the "Menu" button is the timer, which displays the amount of time that has elapsed since the game began. If the Game End Condition was set to "X Minutes Pass," then the timer will instead display the amount of time remaining until the game ends. At the top right of the In Game screen is a box which displays your name. Next to your name is a ship icon which is your team's color. Use this to identify which ships are on your team (same color) and which ships are on opposing teams (different color). It also displays how many Kills and Deaths you have aquired during the game. These are next to the green checkmark and red X respectively. In Frenzy or Capture the Flag game types, the number of goals or flags which you have obtained or returned will also be displayed next to the goal icon. Inbetween these two boxes, at the top center of the In Game screen, is your rearview mirror. This displays the visible portion of the maze behind your ship. At the center of your screen is the Main Display. It is your primary viewport into the maze and shows what's in front of you. To the left is your health bar. When you are hit by an enemy bullet, your health drops a little. When you pick up a health powerup, your health is restored. When the blue health bar is as tall as it can be, your health is full, and when it is reduced to nothing, you will die. Your health will very slowly replenish itself over time. Keep an eye on it to know whether you should be playing offensively or defensively! To the right is your ammo bar. Each green dot is a single bullet which you can fire. You can carry up to 30 bullets, and whenever you fire a bullet you will lose a dot of ammo. Your ammo slowly replenishes itself, but not fast enough to be helpful in combat, so if you start to run low on ammo, pick up an ammo powerup before someone finds you. Below the Main Display window are a number of important indicators about your ship's status. On the left are three lights which show whether or not you have certain powerups. The purple light indicates whether or not you have the Fast Bullets Powerup. The green light indicates whether or not you have the Speed Powerup. The blue light indicates whether you have the Shield Powerup, and how full it is represents how much of your shield remains. On the right are three red lights which indicate how many seeker bullets you have. You can hold between zero and three seeker bullets at once. In the middle is your radar. It displays the important objects which are in front of you in the maze. In the radar you can see the edges of the maze area, powerups, other ships, bullets, Frenzy goal regions, and Capture the Flag bases. At the bottom of the In Game screen is a list of all of the teams in the game, in order of highest to lowest score. The team at the top of this list is winning. Your team is highlighted. Each team in the list consists of a few elements. First is the rank of the team displayed in gold. If a team is tied for a rank with another team (because they have the same score), then some ranking numbers may appear more than once. Next is a ship icon which shows the team's color. To the right of the ship icon is the team's score. After that, in a Frenzy or Capture the Flag game, the number of goals or flags which the team has aquired will be listed next to a goal icon. In Capture the Flag, that will be followed by the number of flags that the team has lost to other teams. Finally, the total number of Kills and Deaths of the members of the team are displayed next to a green checkmark and a red X. To play the game, you must move your ship through the maze. To do this, press the arrow keys. Pressing the up or down arrow keys will move your ship forward or backward. Pressing the left and right arrow keys will turn your ship 90 degrees to the left or right. The keys W, A, S, and D may be used instead of the arrow keys. If you are holding down the up or down arrow keys while you press the left or right arrow keys, you may not turn immediately; instead, your ship may go a little farther to get to the next place where turning in that direction is beneficial. This feature helps you avoid turning too early when you're still next to a wall. If you want to turn so that you're facing a wall, release the up or down arrow before pressing the left or right arrow. Simply tapping the key in the direction you want to turn is enough. You do not have to hold it down unless you want to turn more than 90 degrees. To shoot a bullet, press the spacebar. You can hold down the spacebar to shoot bullets as fast as possible; tapping the spacebar repeatedly is not necessary. Press the F key to shoot a seeker bullet if you have one. Holding down the F key will not shoot successive seeker bullets; you must press it once for each seeker bullet that you want to fire. If you don't like the default keys for the game, you can change them. Open customkeys.txt (in the same directory as mazewars.exe) and follow the instructions given. Every player in the game is represented by a hovering ship. The ship is colored by their team color. Ships are displayed on the radar as small triangles. When you are hit by a bullet, a red indicator will flash on your screen that indicates the direction you were hit from. When this happens, you should usually move so that you're not in the line of fire. To kill an enemy opponent, you must fire bullets at them. Each bullet that hits a ship will reduce its health by a small amount. When a ship's health is depleted, the ship will explode and respawn elsewhere, increasing the victor's Kill count and the victim's Death count. It is not uncommon to die very frequently, but the penalty for death is fairly low: you appear in a different part of the maze with full health and full ammo, and any powerups you had obtained are lost. You will also have one seeker bullet regardless of how many you had before you died. Your bullets can only hurt enemy ships. In fact, they go through ships on your own team, so don't be afraid to shoot an enemy which is on the other side of a friendly ship. Seeker bullets are like normal bullets except for two things: they do more damage, and they can turn around corners. If a seeker bullet notices a nearby enemy player down a pathway to either side, it will turn in that direction. This is helpful when you have nearly killed an opponent but they escaped to the side; shooting a seeker bullet may finish them off. In addition, because seeker bullets do a little more damage than normal bullets, if you find yourself face to face with an opponent you may want to shoot seeker bullets at them, so that you increase your chances of killing them before they kill you. All normal bullets are green, and seeker bullets are red. Bullets are displayed on the radar as small green or red dots. Powerups are a crucial part of the gameplay in Maze Wars, and they can decide how long you stay alive. There are two sizes of powerups: large powerups and small powerups. There are three types of powerups in each size. To get a powerup, simply move your ship into it, and it will take effect. Small blue powerups are health powerups and will fully restore your health. Small green powerups are ammo powerups and will fully restore your ammunition. Small red powerups are seeker powerups and will give you a single seeker bullet if you have fewer than 3. The types of large powerups that you have are displayed on the Dashboard. Large purple powerups are fast bullet powerups. They allow you to shoot bullets at a faster rate, and they make your bullets travel more quickly. This can give you an advantage when face to face with an opponent, and make you more likely to kill an enemy which is running away. Large green powerups are speed powerups. They cause your ship to move and turn more quickly, which is helpful when chasing an opponent, running away from one, or searching for a goal or flag. Large blue powerups are shield powerups. They give you a shield which prevents bullets from damaging you. This shield disappears over time, and when a bullet hits you it both reduces the amount of shielding you have left and makes the shield deplete faster. 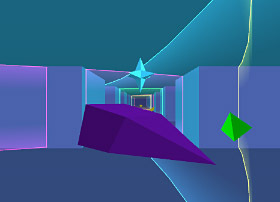 A shield appears to other players as a bright blue ring surrounding your ship; the brightness of the ring is proportional to how much shielding remains. A shield will only keep you safe for a few seconds, but it increases your chances of winning a battle or running from an opponent without dying. Powerups appear on the radar as small or large dots of the powerup's color. If you need a powerup of a certain type, you should check the radar to see where one is. There are three different game types. Although the game mechanics are the same for each, the objective is different. The game type is chosen in the Game Settings tab on the Game Setup screen. In a Skirmish game, the objective is to Kill opposing ships without letting them kill you. There are no additional rules. In the Frenzy game type, there is a circular region within the maze where a "goal" is hidden. When a player finds and obtains the goal, the region moves to a different area of the maze and the goal is randomly replaced inside it. The region is displayed on the radar as a large white circle and in the Main Display the edges of the region are displayed as a bright white wall. Obtaining the goal awards points to your team depending on the Game Settings. Your primary goal in this game type is to find and retrieve the goal as many times as possible, and, naturally, to prevent your opponents from doing the same. In a Capture the Flag game, there is a base assigned to every team. Each base is circular and they are positioned in order to be as fair as possible to each team. The bases appear on the radar as large circles and in the Main Display their edges appear as bright colored walls. The color of a base is the same as the color of the team which owns the base. Whenever you die and are respawned, you will be inside of your team's base. Each team has a "flag" in their base which looks the same as the "goal" in a Frenzy game, but has the team's color. You can see your own flag on the radar as a small circle. You can't see other team's flags on the radar. The objective is to find an enemy flag in one of the enemy bases, and return it to your base. You can pick a flag up by moving through it just like a powerup. While holding an enemy flag, it hovers above your head for all to see, and it will be displayed in the upper left of the Main Display. If you can return to your base with the flag, then you will gain points for your team depending on the Game Settings. If your base overlaps with the base that the flag belongs in, then you must also leave the base in which you obtained the flag to return it. If one of your team members is holding an opponent's flag, then you can see the flag on your radar as a small circle around that teammate. You cannot pick up your own flag. You can only pick up one flag at a time; if you pick up a second then the first returns to a random position within its team's base. When you pick up a flag, you will lose the effects of the Speed Powerup if you have obtained one, and if you have a Shield then it will begin to deplete as fast as if you had been hit by a bullet. This increases the difficulty of returning a flag to your base. If you die while holding a flag, it returns to its team's base. In Capture the Flag, you regenerate health at a slightly increased rate if you are within your team's base. However, if you sit on top of your flag, you will degenerate health very quickly; if you stay there too long you will die. This is to prevent players from guarding their flag too closely. Although these rules may seem complicated, in practice the game is very simple: find an opponent's flag, and bring it back to your base. To enter the Menu screen, either press the "Menu" button in the upper left or press the Escape key. The menu offers a few options which differ depending on whether you're in a Single Player game, hosting a Multiplayer game, or joined a Multiplayer game. In Single Player mode, entering the menu pauses the game. The "Resume" button closes the menu and returns you to the game. This can also be done by pressing the Escape key. The "Restart" button (Single Player only) restarts the game immediately. The "Quit" button (Single Player only) quits the game and returns you to the Game Setup screen. The "End Game" button (Multiplayer Host only) ends the game as though the Game End Condition had been met. The "Your Ping" display (Multiplayer Joined player only) shows the number of milliseconds that it is taking for messages to reach the Host and return to you. The "Disconnect" button (Multiplayer Joined player only) disconnects from the game and returns you to the Main Menu. When a game is over, the Main Display will turn black and display the final results of the game. This includes whether your team won or lost (or which place it came in) and individual player statistics. Choose a team to view by either clicking the green left and right arrows, using the left and right arrow keys (to cycle through the teams in order) or using the up and down arrow keys (to cycle through the teams in order of rank). Each player of the selected team will be listed, along with the number of Kills and Deaths they aquired, and the number of goals (Frenzy) or flags (Capture the Flag) that they obtained. The "Replay" button (Single Player only) restarts the game with the same settings. The "Next Mission" button (Mission Mode only) quits the mission and returns you to the Mission Selection Screen, where you can begin the next mission. The "OK" button (Multiplayer only) lets you indicate that you are finished looking at the end game statistics. When all players have clicked the "OK" button, you will return to the Game Setup screen with them. The "Force End Game" display (Multiplayer Host only) allows the host to return everyone to the Game Setup screen without waiting for them to click "OK."
The "Disconnect" button (Multiplayer Joined player only) disconnects you from the game and returns you to the Main Menu. One of the buttons will be highlighted. You can press the spacebar to activate the highlighted button without using your mouse. If you choose "Observer" as your team in the Game Setup screen, you will appear in the center of the maze. As an Observer, you have no influence over the game; ships can go right through you and you can't shoot bullets or pick up objects. A number of interface elements are removed since they are unnecessary. As an Observer, you can travel quickly through the maze and even go through walls. By default you are in the normal In Game view. However, you can switch to the Overhead view by pressing the spacebar or the tab key. In the Overhead view, you can see the layout of the maze and the ships within it. Use the arrow keys to navigate around the maze. To switch back to the In Game view, press the spacebar or the tab key. While in the Overhead view, you can press the Page Up or Page Down keys to change your height over the maze. If you reduce your height enough, you will return to the In Game view. While in the In Game view, you can press the Page Up key to return to the lowest height of the Overhead view. These keys can be remapped like the other in game keys. The majority of the game is the same in Multiplayer mode. However, there are some additional features and some minor differences. To host a Multiplayer game, select "Private Game" on the Main Menu and then select "Host Game." You must select a port on which your computer will recieve incoming connections from other players. Using the default value is usually fine. It is important to make sure that your firewall or router is not blocking incoming connections on the port, or else players will not be able to join your game. To join your game, other players will need to know your IP address. This will be displayed in the upper right of the Game Setup screen. Unfortunately, if you are on a LAN, your LAN IP will be displayed and outsiders will not be able to use it to connect to your computer; in this case you will have to determine your true address some other way. 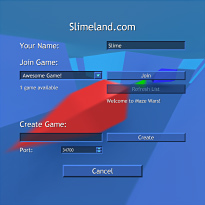 You can also host a public Multiplayer game by selecting "Slimeland.com" on the Main Menu and then using the Create button. This works the same way, except that the game is automatically hosted on port 34700; make sure you can recieve incoming connections on this port or else no one will be able to join your game. To join a Multiplayer game, select "Private Game" on the Main Menu, and then select "Join Game." Talk to the person who is hosting the game you want to join to find out what their address is and what port they are hosting the game on. Enter these values and press "OK" to join the game. You can also get a list of public Multiplayer games by selecting "Slimeland.com" on the Main Menu and using the Refresh List button. If there are any games available, you can then choose one and click the Join button to enter them. In Multiplayer mode, a chat window is provided in the Game Setup screen with which you can talk to the other players in the game. Type in the textbox and either hit the Enter key or press the Send button to send your text. Typing "/me" or "/emote" before your chat text will display that you are "doing" something. For instance, the text "/me will win" displays the message "<your name> will win" to all players. Additionally, when a player enters or leaves the game, that information will be displayed in the Chat Window. You can drag the horizontal bar between the chat window and the game setup options to change how much space each takes up. In Multiplayer mode, regardless of whether or not "Advanced team options" is checked in the Teams tab, a list of teams will be displayed. Each team displays the number of AI players on it, and radio buttons are provided with which you can choose your team. There is also an additional column in the Teams tab in Multiplayer mode. The "Other Team Members" column displays what other people are on each team. You can use this to see what teams the other players have chosen to play on. Only the host can change the majority of the game settings. If you are not hosting the game, you will be unable to change any of the settings in the Game Setup screen. You can, however, select which team you will play on. Once the host has started the game, gameplay will progress as in a single player game. When you see another player in the maze, and that player is not an AI player but is a human who joined the game, their name will be displayed over their ship. To chat with other players in the game, press either the T key or the Enter key, and the chat interface will appear. The chat works just like the Chat Window in the Game Setup Screen. By default, all chat will appear for a short time on the Main Display. To disable this, uncheck "Display chat on screen" in the chat interface. You can choose who to chat with by selecting an option from the "Send chat to" dropdown. You can send chat to all players, to players on your team (default), or privately to an individual player. By default, when you open the chat interface, your chat will be sent to your teammates. However, if you hold the shift key down while opening the chat window, the chat will be sent to all players. This is a handy shortcut, but be careful not to send messages intended for your team to all players! After sending a message, if you are playing the game (that is, if the game is not over and you are not an Observer), the chat interface will close. If you want to close the chat interface without sending your message, press the Escape key. If you want to close the chat interface without clearing the chat text, press alt+T. If you have the chat interface open and you need to do something in the game (such as move your ship with the arrow keys), hold down alt and your input will go to the game instead of the chat interface. Observers may not chat privately with individual players who are not also Observers. If the host leaves the game, the game will end and all players will be disconnected. If any other player leaves the game, they will be replaced with a Medium AI player until the game ends. Don't always take the default options in the Game Setup Screen. Try out different combinations of game types, end conditions, scoring criteria and mazes! Learn to move backwards. It allows you to do damage to an enemy even while running away from them, and is faster than taking a U-turn. Learn the benefits of powerups and make use of them. Use your Seeker bullets. If you die with seeker bullets left, then the potential extra damage has gone to waste. If you get shot, and you're not certain you can kill the attacker, run away and look for a health powerup. Check your rearview mirror, especially while looking for goals or flags. When you're confronted with an enemy player that has a shield, hit them with a bullet or two and then run away. The next time you encounter them, their shield will have depleted significantly. Don't move in straight lines for too long. Keep your movement unpredictable and you'll be more likely to survive. 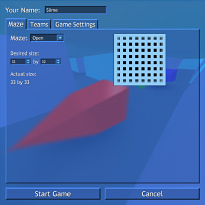 Maze Wars was programmed in C++ with OpenGL. I began work on it during Christmas break 2003-2004 and completed the first beta version in the Summer of 2004. The second beta was created during the fall and completed in early 2005. Maze Wars and the contents of this page are copyright © 2004 - 2005 John Haggerty.